What happens when you put 62 barrels of bourbon on a ship and send it around the globe. A few years back, Jeffererson’s Bourbon owner Trey Zoeller went out on the water with his friend Chris Fischer, the founder of OCEARCH, a global shark tracking research group. Like any good Kentucky boy, Zoeller broke out the bourbon when the fishing was done. The two friends sat on the bow, content, watching the liquor slosh from side to side in the bottle. That’s when Zoeller had an idea: ocean-aged bourbon. For his first experiment, Zoeller put a few barrels on Fishcher’s ship and bid them adieu as they traveled with the researcher, chasing after great white sharks. After nearly four years, Zoeller tasted the bourbon and was blown away. Constant sloshing meant constant contact with the wood, which sucked the astringency out of the whiskey. It was rounded with lots of caramelized flavor and a Scotch-esque brininess. The problem: He only made 250 bottles. Last night, New York got a taste of the Jefferson’s Ocean II, of which there are 62 barrels. This time, Zoeller started with bourbon that had been aged 6 to 8 years on land and then stowed on the ship for just six months. In that time the ship zigzagged across the globe, stopping at 31 ports and crossing the equator four times. While I never tasted the original ocean-aged bourbon, I can say that this version showed the caramelized, almost rum-like notes that the original was said to have had, as well as a tingly, briny finish. Smooth and weighty on its own (no rocks needed), the bourbon also did well in cocktails—especially one made with pineapple juice and ginger liqueur, which highlighted the bourbon’s tropical qualities. This method of rapidly aging whiskey may seem odd, but Zoeller claims that it is rooted in history. “Whiskey was aged for the first time when it was floated down the Mississippi then up to New York,” he says. 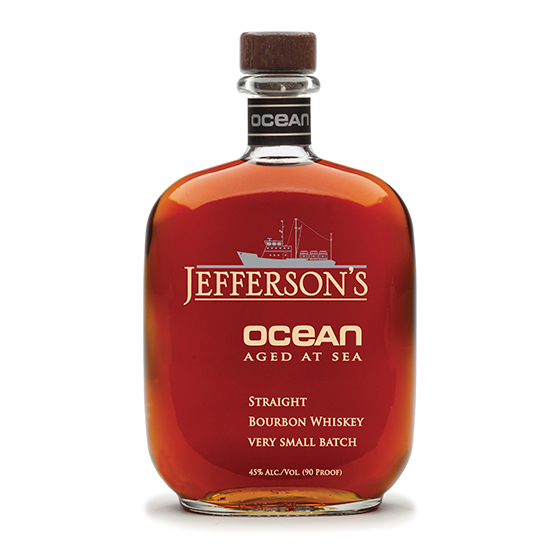 “This was the original maturation process.” Jefferson’s Ocean II is hitting shelves now.